Why Does My Monitor Go Dark for a Few Seconds? - Ask Leo! A monitor going dark could indicate a couple of different problems, but it doesn't necessarily mean you have a hardware issue with the computer itself. I'll show you a couple of ways to diagnose the problem. Leo, I’ve got an HP Pavilion H8 1017, which I love dearly. I’m on a Windows 7 operating system and it’s standalone. I use it mostly for graphic work: Photoshop, video editing, and the like. Lately, my screen goes black for about 10 seconds whenever I stop what I’m doing and open another program. I’m afraid that this may be a prelude to the blue screen of death. I do disk cleans and defrags regularly. I have McAfee protection and AOL computer checkup and backup. Please help! I don’t want my HP to become the recently departed. A screen going dark isn’t likely to be a computer problem; it’s probably a monitor problem. Your HP is a desktop model, which means you have a separate monitor. I have a similar problem with my machine. After doing some research, I have a couple of ideas. Let’s start by getting some of the obvious things out of the way. 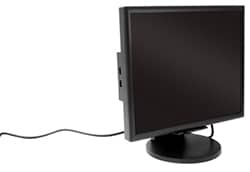 Sometimes, a monitor blackout can be as simple as a loose cable between your computer and its monitor. Just jiggling the cable a bit might cause an intermittent connection, which causes the screen to go dark. Make sure the cables are properly and securely connected. It’s not likely that this is an issue related to the computer itself, but you can rule that out easily by simply plugging in another monitor. If you don’t have an extra one from another machine, borrow one from a friend. It doesn’t have to be the best monitor; you just need it long enough to connect to your HP computer for a while. Once plugged in, do what you normally do and see if the screen ever goes dark. I suspect that you won’t see this on the new monitor. If that’s the case, then the problem is with the original monitor. In your question, you mentioned that you’re doing graphics and video work. To me, that says you’re doing some visually intensive tasks. Monitor quality is also probably pretty important to you. That said, my research seems to indicate that some of the components in your monitor could be stressed, resulting in this symptom. One simple fix may be to reduce the brightness of your monitor. This may reduce how often your screen goes dark. If you can live with a not-as-bright display, it may even lengthen the life of this monitor. But if that’s not an acceptable option to you or you continue to experience problems, this may be an excuse to get yourself a brand new monitor. What’s this obscure message on my monitor and why can’t I make it go away? - Computer monitors are smart devices these days but they too can fail. It’s not always your PC showing an error, and that message on your monitor might be from the monitor itself. « Previous post: How Do I Use and Clear Outlook.com Contacts and Auto-complete Suggestions? The video card/chip could be malfunctioning. My old monitor had a test screen that did not need a computer to be hooked up. It came on when the thing was turned on, but disconnected. Check the manufacture’s website for the instructions. Most new HDTV can act like a monitor. You may have heard of the capacitor problem found on a lot of motherboards ? Check your caps and if they look as if something has leaked from them OR the top has a bulge (of any amount) outwards then you have a capcitor problem. Monitors suffer from the same thing and I have fixed many monitors by replacingf all suspect capacitors. Well my build in laptop LED display does goes dark a few seconds every 5 minutes or so. It is software problem, when I’m using fast startup feature of Windows 8. Disable fast startup, problem solved, but can’t enjoy the improvement made in Windows 8. When my monitor goes black for a few seconds and comes back on I get this message: “DISPLAY DRIVER HAS STOPPED RESPONDING AND HAS RECOVERED. Display driver NVIDIA windows kernel mode driver version 185.95 stopped responding and has successfully recovered.” It happens mostly when I am accessing e-mails??? My guess would be that it is not your monitor with the problem, but the wiring in your house. It may simply be bad extension chords, or too many things plugged into one circuit. Over time constant electric brownouts like that will damage equipment so you’ll want to get the wiring checked out, or get some battery backups for sensitive equipment. I have the same problem when I hang up my phone, but in my case I know it’s a cable that needs replacing that gets bumped. I would, of course, check the cable. A marginal connection could be susceptible to minor power fluctuations. Of course it might be a major power fluctuation, which means it’s more of an electrical problem with the house than the computer – the monitor’s just the most sensitive. A UPS would be an expensive solution, but a solution nonetheless, since it would maintain proper voltage for both the monitor and computer if the problem is systemic. I too have had this problem. It was a simple case of malware. A malwarebytes scan took care of the problem. My monitor goes dark for seconds and Sub D shows up in right had corner. And other times it will just blink a couple of time dark. I need to know why and if I need to do something about it. My monitor goes blank (dark) for a few seconds many times during the day and then comes back. Using a Dell Ultra HD monitor (3840 * 2160 resolution) with NVIDIA GeForce GTX 750 Ti graphics card. Using it at 30 Hz. Also sometimes strange red color dots appear on the monitor at random places on the monitor. The monitor is connected to the computer with an HDMI cable. The suggestions in the article you just commented on pretty much cover everything that you can do to diagnose the problem. I have an ASUS laptop. Mine just started doing the same. As soon as I sign into my email server, the screen goes dark for just a few seconds. I feel it’s more then something plugged into the computer. It happens whether I’m using an external monitor or just using the laptop. Something else has to be going on, it’s happening to too many, and so many different types of computer. This article pretty much contains all the information we can give about that issue. I have a Dell UH2413 connected to a 2+ year old HP Envy i7 and my monitor intermittently blacks out when I am using the snip it tool, during selection process. The screen will disappear then reappear, and repeat until I have finished the snipping. Then it will disappear when I press copy in snip it and reappear again, usually as I am pasting into a word document. The only other program that I can remember it yapping with is Adobe Raw. Never had a problem until this year and have a problem with other applications. I have all of the basic troubleshooting steps and search the. Any thoughts or ideas? Thank you in advance for any assistance that you can provide. Sorry for the ‘misspelling’ on my original post..the problem happened (not yapping) with Adobe Raw and has not happened with other applications, such as Excel, Nikonview, Nikon Transfer, Word, or others. I may have discovered one of the problems, which is software related. I normally use the Dell Display Monitor in automatic mode to switch between color profiles when using photo editing programs versus Excel or Word, etc. Today I manually switched the profile before using Camera Raw and did not have a screen black-out issue…this program is embedded in Photoshop Elements and I could not find a way to configure for it. My guess is that Display Manager gets confused when switching out of Elements to Raw. I test for Snip also.